The Construction Skills Certification Scheme (CSCS) is taking the next step towards ensuring that all CSCS cardholders achieve a qualification, by withdrawing the Construction Site Visitor card. The card was originally introduced for workers who often did not perform a construction role but visited site on a regular basis. CSCS has consulted with the industry to agree a plan that will pave the way for the eventual withdrawal of the card. 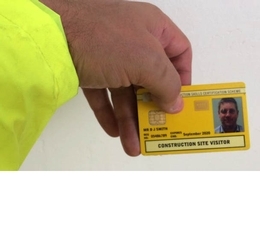 All Construction Site Visitor cards issued from 3 September 2018 will expire on 31 August 2020 and CSCS will stop issuing the card from 28 February 2020. All Construction Site Visitor cards issued before 3 September 2018 will remain valid until their expiry date. This means that many people holding the Construction Site Visitor card will not be required to obtain another CSCS card as they are intended for construction related occupations only, currently many people holding the card work in roles considered to be non-construction related. For those with Site Visitor cards that work in construction related occupations, it will mean a move across to an appropriate skilled card or registering onto the appropriate qualification before their Construction Site Visitor card expires.